With Connor Haag (3) looking on, Olentangy’s Josh Moeller tags out Olentangy Liberty’s Brennan Rowe at second base during Friday’s OCC showdown in Lewis Center. 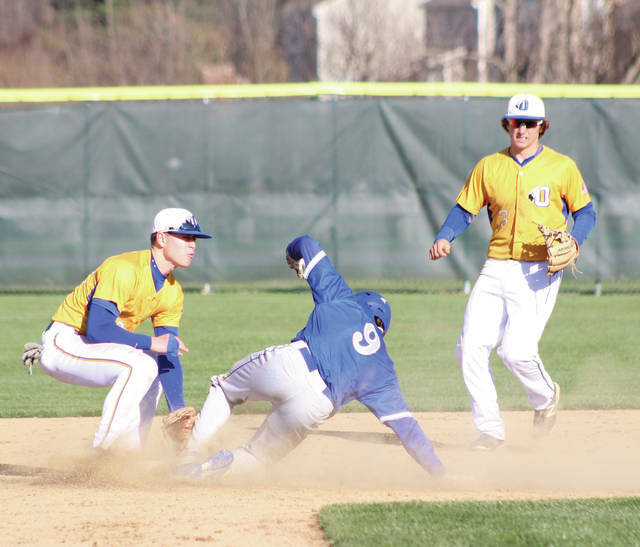 The Olentangy Liberty baseball team found a way to win Friday’s 10-inning marathon at rival Olentangy in OCC-Buckeye play. And the Patriots left no stone unturned in doing so, using power, speed and solid fundamentals in their 6-4 victory to take control of the conference race. Corbin Parrish led off the 10th with a single, went first to third on Mitch Milheim’s base hit and scored on a Connor Osmond sacrifice fly to give Liberty the lead. Justin Nelson drove home Milheim to account for the final margin. Parrish also made a pair of highlight-worthy catches in the eighth on back-to-back plays, diving to take hits away from Bradyon Chitty and Caden Kaiser. Despite their familiarity, both teams executed scoring plays the other has seen dozens of times before. Liberty, which was thwarted in its double-steal play earlier, executed it so perfectly by Michael Osmond and Carson Comer in the ninth that the pitcher didn’t even make a throw. Osmond scored on the play to give the Patriots a 4-3 lead. Olentangy countered with its trusted squeeze bunt in the ninth to tie it up again. Logan Ketron, who had a team-high three hits and led off the inning with a base hit, was already three-quarters of the way home by the time Connor Haag put bat on ball to score the tying run. It was a game of missed opportunities for both teams too. Liberty took the early lead on a Brennan Rowe triple to lead off the second. Milheim followed with a double to score him. But, the next two batters couldn’t move him to third. So, when Michael Osmond lined a base hit to right, Olentangy’s Cole Robinson came up throwing – firing a perfect one-hopper to catcher Lucas Hassinger to gun down the runner. Olentangy had a 3-2 lead on a Ketron RBI double, an error and a Tyler Karbler sacrifice fly when it had bases loaded and one out and couldn’t add to its lead. It was also a game of solid pitching by both staffs with Liberty’s Jack Metzger and Ketron going the front five before giving way to relievers Beau Foster and Caden Kaiser. Foster has proven to be a vital reliever for the Patriots (14-2, 8-1). He worked the final 1.1 innings of Thursday’s win over Westerville Central for the save before tossing 5 innings against Olentangy, allowing a run (earned) on three hits and four walks with a pair of strikeouts for the win. This after he pitched in both games of last Saturday’s doubleheader, including 1.2 innings against Mount Vernon before tossing 4 no-hit innings in the capper against Big Walnut. Kaiser was saddled with the loss, pitching 5 innings and allowing 4 runs (2 earned) on 4 hits and a pair of walks for Olentangy (11-4, 6-2). Olentangy still has two meetings left against Liberty, including one in Powell Monday. Next up, both teams play doubleheaders today. Olentangy plays New Albany and host Gahanna Lincoln, while Olentangy Liberty welcomes Grove City and Cleveland St. Ignatius. Games at both venues are scheduled begin at 11 a.m.